Gab, a social media app dubbed “a haven for white nationalists ” just wants President Donald Trump to notice it. 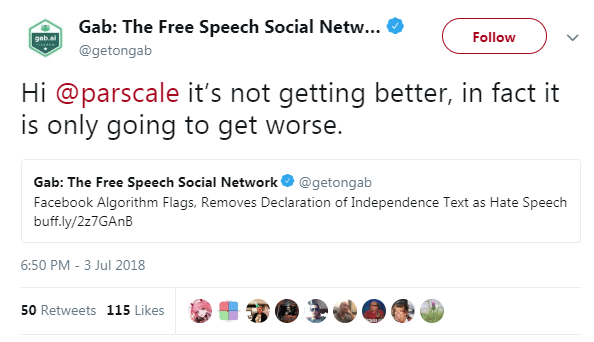 Recently Gab tweeted at Brad Parscale, Trump’s 2020 re-election campaign manager, about the myth that Facebook is censoring conservative speech. Parscale, who was also the digital director of Trump’s 2016 campaign, has taken a combative stance against mainstream social media companies. He trolls  about conservatives being mistreated on social media and has publicly called on Facebook and Twitter not to censor conservative content  leading up to the 2020 election, even though social media companies aren’t actually doing this . 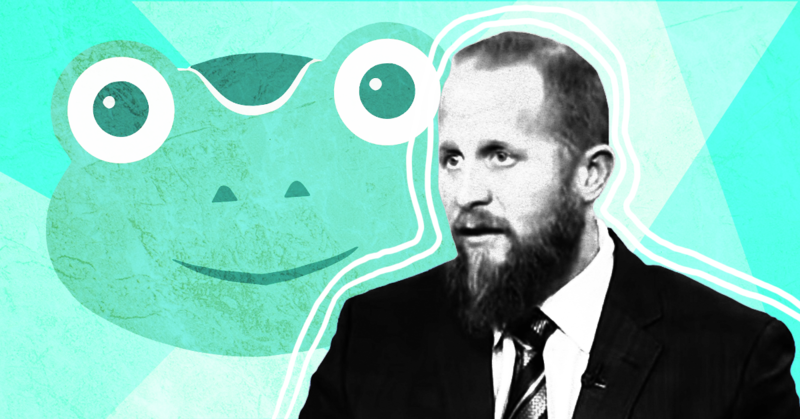 Parscale’s continued calls for tech companies to address a problem that doesn’t exist are disingenuous given that he (working alongside Cambridge Analytica) exploited Facebook’s ad platform  all the way to a Trump victory in 2016 -- even former Clinton campaign staffers have acknowledged  that Parscale's ad buys were much more efficient than their own -- and that Trump himself is the world’s most notorious Twitter user. Parscale’s efforts have worked . Just a few weeks ago, Facebook executives met with Parscale  and other Republican leaders to hear their “concerns.” Twitter CEO Jack Dorsey also recently met  with conservatives. 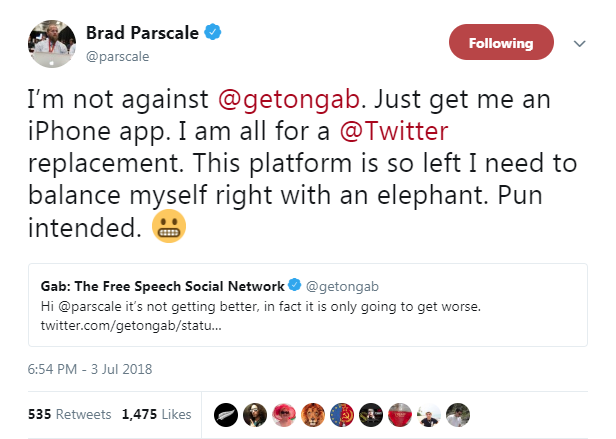 On Twitter, Parscale gifted Gab with a reply. “I’m not against @getongab,” he wrote, but he said he needs the company to do something for him. Remove white nationalists and neo-Nazis  from its platform? Nope. He said he is “all for a @Twitter replacement,” but he’d like Gab to “get me an iPhone app.” Trump’s campaign manager is 100 percent on board with using the social media app that white nationalists favor -- just as long as he can do it from his iPhone! Parscale’s interactions with Facebook, Twitter, and Gab are all political theater. Playing footsie with Gab will get the base excited, and as we’ve learned, Trump faces minimal fallout whenever he caters to his white nationalist constituency . The Trump campaign isn’t going to leave mainstream social media platforms anytime soon either. It needs Facebook, Twitter, and YouTube to win. The campaign spent millions on digital ads in 2016  and that isn’t going to change. No matter how much Parscale whines about social media companies, the Trump campaign can’t afford to abandon them. It's no surprise Parscale made this complaint on Twitter. The tech platforms know this. They also know that the claim of conservative censorship has no basis in reality . But the Trump campaign is still a priority customer. It remains to be seen how much tech companies will cater to the campaign’s demands, and how much that might hurt them with the majority of their other users. As I was writing this up, Parscale tweeted another whine about Facebook. He blamed management's inability to control Facebook's supposedly liberal staff but offered no evidence whatsoever to support the claim. This is frustrating. I want to believe @facebook  is getting this figured out. Maybe management just can’t get control of their liberal staff?